Thank you for visiting U.S. Candle Company where we do our best to provide quality unscented and scented candles, holders and home decorating accessories, friendly customer service, and fast shipping. We keep our prices discounted and strive to keep a wide selection of products for use in your home and for events. Our unscented and scented candles are hand made using quality raw materials. Some of the candles we produce include votives, candle tins, jar candles, tapers, pillars, tealights, soy candles, floaters, pies, cakes, and more. Our unscented candles are available in a wide selection of vibrant, trendy, colors perfect for decorating weddings and events. We carry candle holders and decorative accessories for creating beautiful centerpieces and arrangements. 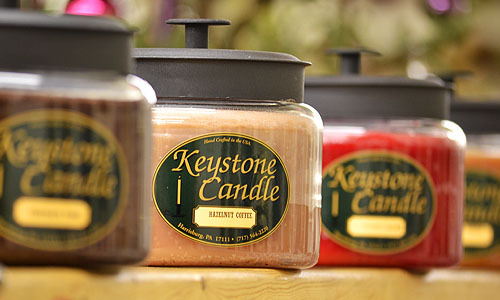 U.S. Candle Company manufactures scented and unscented candles in Harrisburg, Pennsylvania. We wholesale candles at discounted prices giving retail stores an edge over the competition. Our selection of colors, styles, and fragrances are hard to beat. We know today's customers demand that we provide quality candles at affordable prices and with over 30 years in the candle industry that is what we do. Why Buy from U.S. Candle Company? We are a small family business located in Pennsylvania and all of the candles we manufacture are hand made right here in the United States by American workers. We take pride in our products and make sure we are putting out quality candles that will perform the best in both the way they burn and the fragrance they give off. Not every item on our website is manufactured by us, we do supplement our own lines with some candles and accessories made overseas. We offer a large selection of different candle styles such as pillars, jars, votives, tapers, pies, cakes and more. Within these styles, our candles come in a variety of options such as various sizes, colors, fragrances, and types of wax. In our pillar candles alone, we have 13 different sizes available ranging from small 2x3 up to large 6x9 three wick candles, not to mention 3 different looks, and over 50 scents. With so many candles and accessories to choose from, there is something here for everyone, to decorate anywhere, and for any occassion. In addition to selling our products to the end user, we also have opportunities for individuals, groups, companies, and organizations to make money. Our wholesale candle program is designed to give retailers and owners of websites a way to expand their product lines and increase profit margins. When you purchase our candles wholesale from us, you are buying directly from the manufacturer. This means that you are getting the lowest possible cost for the product allowing you to sell the items at a competitive price. We also offer discounts to wholesale accounts on accessories and items that we do not make. For individuals, groups, sports teams, and other organizations, we also have a candle fundraising program. The fundraiser has no limit on how small or large a group has to be, is easy to run, and can produce a good profit. Our scented jars are one of our most popular products. Our customers love the way our jar candles burn all the way out to the edges and the whole way to the bottom of the jar. These scented jar candles continue to put out fragrance until all the wax is gone so you will get hours of enjoyment out of your purchase. Scented pillars are the perfect candle for use in home decorating. Our large assortment of colors and sizes makes it possible to create unique arrangements and center pieces. These scented pillars have a smooth outer finish with fragrance and color the whole way through. Our large 6 inch diameter pillar candles have 3 wicks in them and look gorgeous when they are lit. These scented votive candles will burn for about 15 hours. The burn time can be affected by the size of the votive cup, the larger the cup, the faster the burn. Our hand poured scented votives and are available in over 100 different fragrances. We also offer unscented votives in a wide selection of colors for use at weddings and other events where food will be served. Votive candles are often used as wedding favors. Our unscented pillars are ideal wedding candles because we offer them in a wide variety of colors as well as ivory and white. Our unscented pillars are not a solid color the whole way through, they have a white inner core with a colored coating on the outside. We have beautiful wedding candles to use as decorations on your special day. Some of our unity candles also have matching taper candles available. All of our wedding unity candle sets are unscented. Lighting a unity candle during the wedding ceremony symbolizes a man and women becoming one. Combine these with our wedding candle holders to create an elegant display for your ceremony. We wholesale candles, holders and accessories to registered wholesale accounts who meet the requirements for membership. If you would like to purchase candles wholesale please register your company by clicking on the "register" link to create a username and password. We wholesale candles both nation wide and internationally. Once you have registered contact us to let us know your interested in purchasing wholesale candles so we can activate your account. Using textured pillar candles is becoming a very popular among home decorators. They contrast well with many of the straight smooth edges in homes today. These scented candles have fragrance and color the whole way through. No two pillar candles look exactly the same. Create elegant arrangements by placing these pillars on holders of different heights. Battery operated candles are a popular item in our product line. The battery powered candles are controlled by an on/off switch located on the bottom. The battery pillars are available in 3 sizes. We also have outdoor battery candles that will not melt in the heat, battery votives, and tealights. A few of our battery candles have built-in on/off timers. Our numbered birthday candles make fantastic 1st birthday gifts. These birthday candles countdown from 1 to 21 on a decal in the front. Every year the birthday candle can be burned down to the next year. We have musical flower birthday candles that work as their own mini light show. These musical flowers start with a large center flame which ignites 14 mini candles, spins, and plays "Happy Birthday" song. Home decor has items that are used to decorate but not necessarily in combination with candles. If you are looking for decorating products for general use we have some stunning designer pieces to help with your projects. Our Tealight candles have a burn time of about 4 hours. These small candles can be used as accents around centerpieces or table arrangements. Use Tealights around your bathtub or hot tub to create a romantic and relaxing atmosphere. Unscented tapers, like the unscented pillar candles, are a popular choice for decorating around food and at wedding receptions. 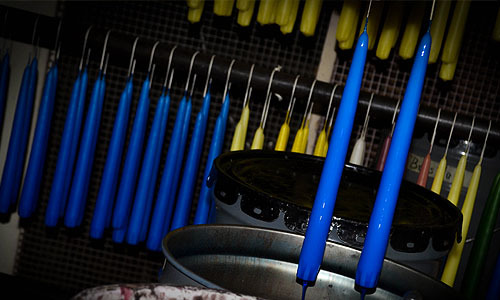 We offer our unscented taper candles in an impressive assortment of colors. These are a white taper core overdipped in a colored wax. Our tapers are dripless but must be burned according to our burning instructions. Our tapers will fit into standard size holders. This style of candle is most often used at elegant events such as weddings. Unscented disk floating candles are a brand new product in our candle line. We offer unscented floaters in vibrant colors all inspired by today's hottest decorating trends.These wedding candles make beautiful displays on reception tables. These unscented floating candles are a simple yet elegant piece to use when setting up your table arrangements. Our candle tin is a popular candle type to use as gifts for occasions such as bridal showers, baby showers, wedding favors, corporate thank you gifts, and more. The reason these candles are so popular is that we can make a custom label on the lid of the tin. Our candle tins are strongly scented and burn beautifully. Burn these tins on holders to keep table surfaces from getting damaged by heat. We offer candle tins in two sizes. Pie candles are one of our newest candle lines. Our apple pie candle is the biggest seller and has even been nearly eaten as it sat among some real pies on a dessert table. 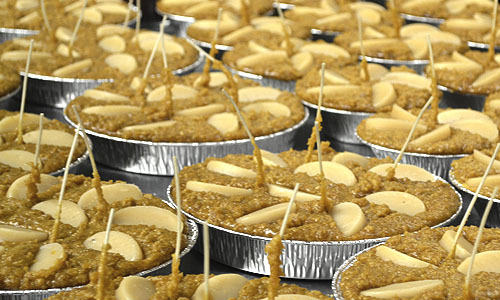 Each element of our pie candles is scented so you will enjoy the fragrance the entire time you burn them. We currently sell apple, blueberry, cherry, peach and pumpkin pie. These colored unscented votive candles are popular with wedding coordinators and event planners. Our unscented votives are mostly used during wedding receptions and dinner parties. They are inexpensive candles and are unscented so they are perfect to use around food. There will be no fragrance to interfere with the way food will taste. Our unscented votive candles are available in two sizes and a wide variety of colors. Our pillar holders come in a variety of sizes and styles, from the casual everyday candle holder to the elegant holders sought after by avid home decorators. We carry pillar candle holders that will fit all different sizes of single candles or allow you to arrange multiple candles on one holder to create unique candle displays. We carry a nice assortment of votive candle holders. The votive cups are available in clear glass, ceramic, ironware, and more styles are being added as they become available. Votive cups are a must when burning votives since they designed to completely liquefy. The burn time of a votive is greatly affected by the size of the votive cup. A larger votive cup will cause your votives to burn much quicker than a cup which is only slightly larger than the candle. Candle warmers allow you to enjoy the same candles you would normally burn but without the need to have an open flame. We carry a wide selection of candle warmer designs with short sayings and painted themes. The large candle warmer can be used with our 26oz and 16oz jar candles. We also offer the Aurora Candle lamps, and lanterns. These electric glow bowl fragrance systems have become a hit in our outlet store so we are now making them available across the United States. These bowls still give you strong scent while also giving off a soft glowing light. The glow bowl product consists of a glass bowl which is filled with a scented gel. A low watt light bulb then warms the gel from below releasing the fragrance into the air. A beautiful selection of beaded garlands in 5 foot lengths. The beads on these strands of garland are attached to the line. This allows the garlands to be cut to any length without the beads coming off. Our beaded garland come in a large selection of designer colors which are perfect to use with our candles in your home or for special events. We offer a wide selection of jar holders, many of which can also be used with other types of candles. Our two best selling holders are the ironware holder and the country wire holder. These two holders are designed to fit our 26oz and 16oz jar candles. We also have stylish square plates to place your jar candles on to help protect your table surfaces from heat damage. We manufacture soy votives, soy jars, and soy tarts using 100% soy wax and natural wicks. The scented soy candles come in a wide selection of colors. Our unscented soy candles have the natural soy color.